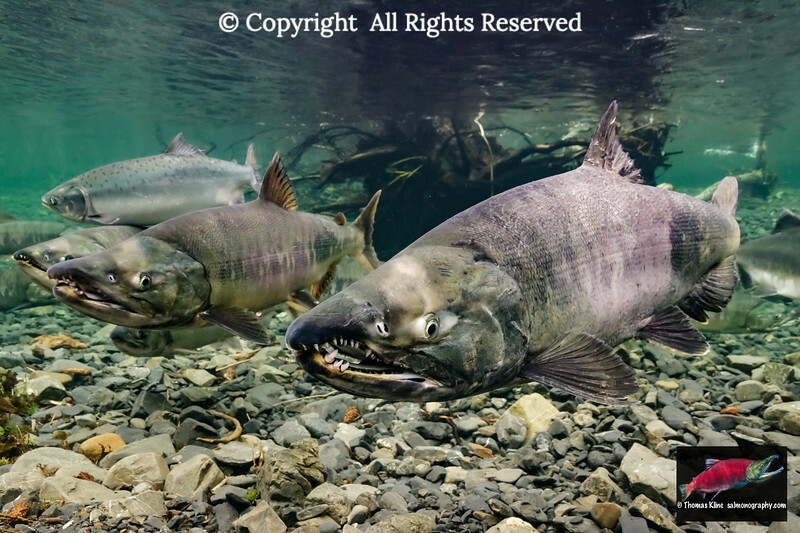 Chum Salmon (Oncorhynchus keta) are also known as Dog Salmon because of their long teeth. 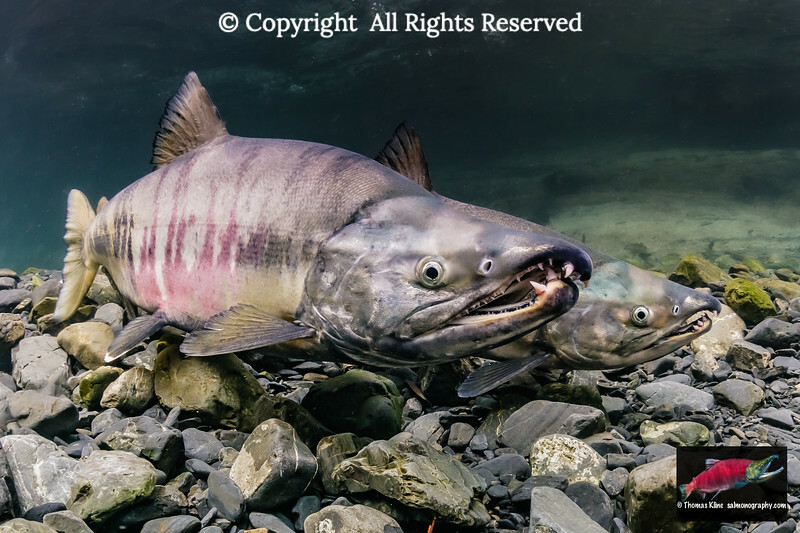 Chum Salmon have the longest teeth relative to body size among the extant Pacific salmon species. 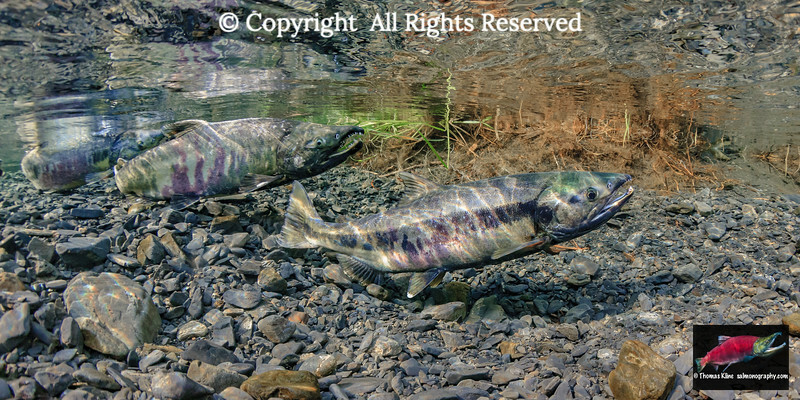 Chum Salmon in the Prince William Sound area spawn alongside or near to Pink Salmon including the intertidal. 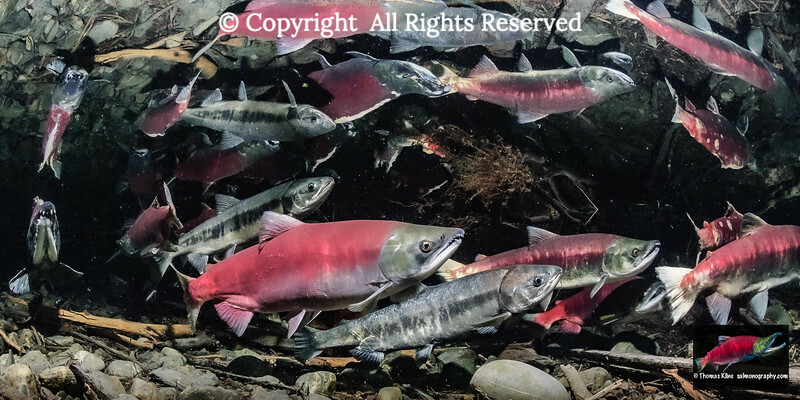 As well, Chum salmon will smolt soon after emerging from the redd but unlike Pink salmon are not silvery and have parr marks not too different from those of Sockeye Salmon. 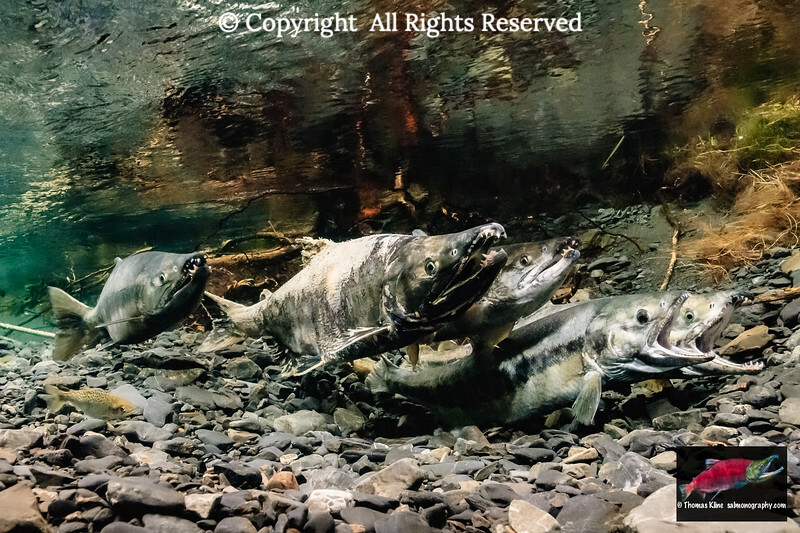 Chum Salmon (Oncorhynchus keta) upstream spawning migration. Aspect Ratio = 1:2. 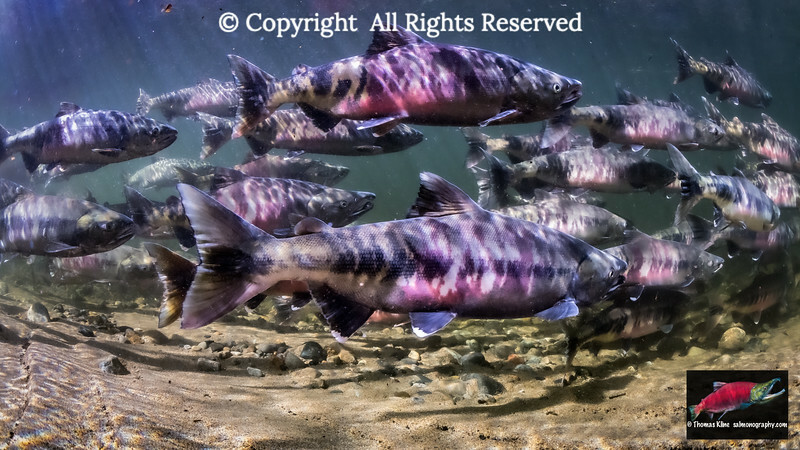 Chum Salmon (Oncorhynchus keta) spawning migration. Aspect Ratio = 1:2. 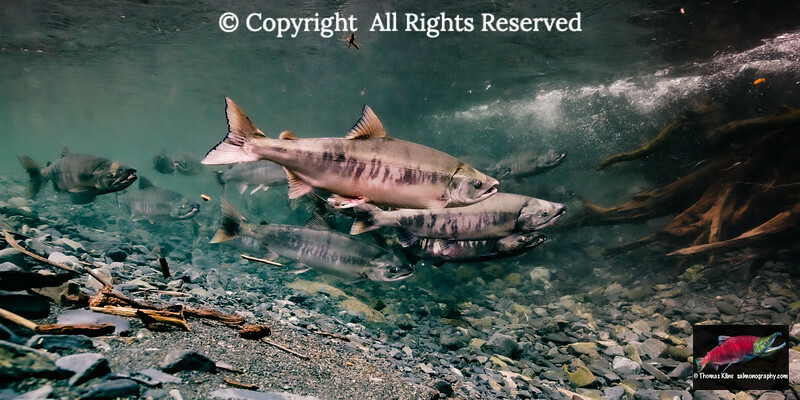 Chum and Pink salmon (Oncorhynchus keta, O. gorbuscha) spawning migration in a tributary of Prince William Sound, Alaska. Aspect Ratio = 1:2. Female Chum Salmon (Oncorhynchus keta) excavating her redd in stream gravel alongside spawning Pink Salmon (Oncorhynchus gorbuscha). Aspect Ratio = 2:3. Chum Salmon (Oncorhynchus keta) commencing to spawn. Aspect Ratio = 2:3. Chum Salmon (Oncorhynchus keta, Salmonidae) fry near mouth of stream while migrating out to sea near Cordova, Southcentral Alaska. Spring. 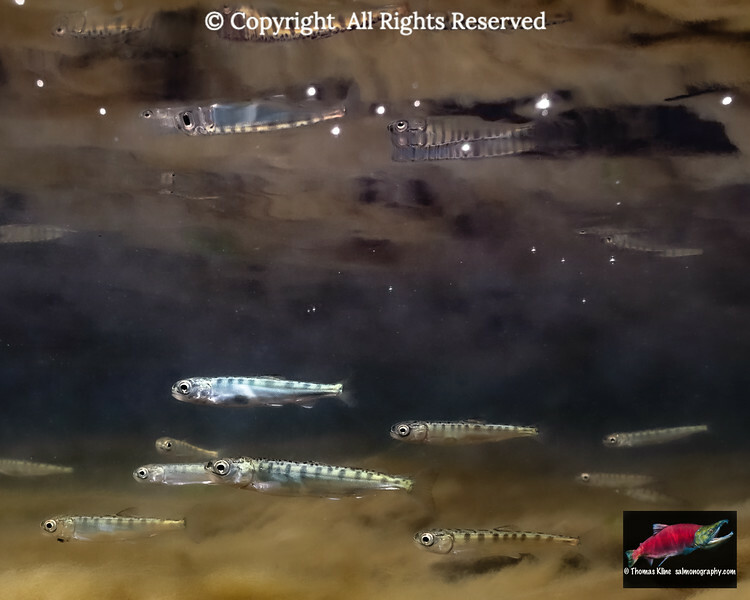 Chum Salmon (Oncorhynchus keta) fry near mouth of stream while migrating out to sea. Aspect Ratio = 4:5. 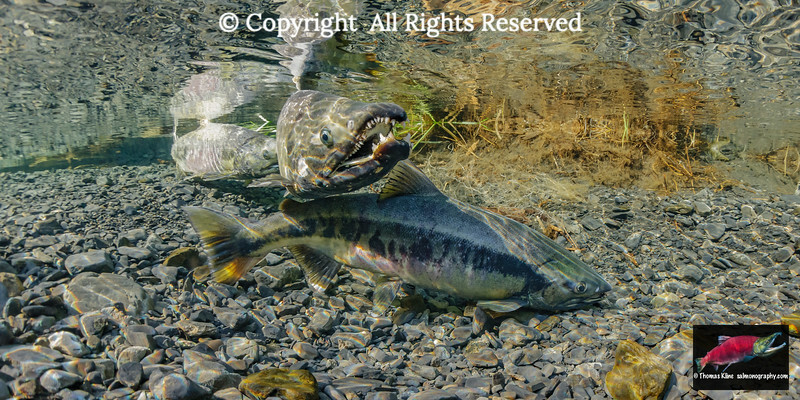 Chum Salmon (Oncorhynchus keta) alongside Sockeye Salmon (Oncorhynchus nerka). Aspect Ratio = 1:2. 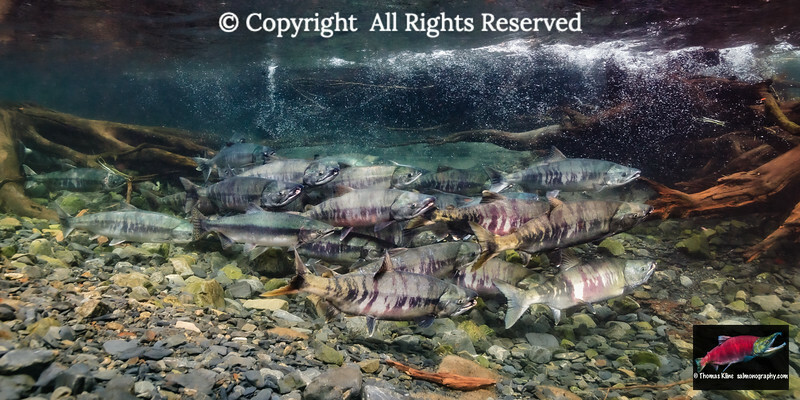 Chum Salmon (Oncorhynchus keta) spawning migration in a tributary stream of Prince William Sound, Alaska. Aspect Ratio = 1:2. 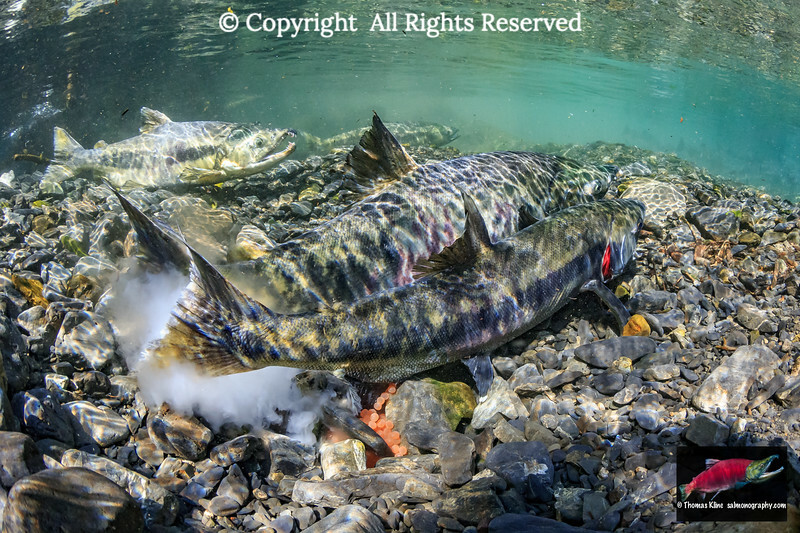 Chum and Pink salmon (Oncorhynchus keta and O. gorbuscha) spawning migration in a tributary stream of Prince William Sound, Alaska.Aspect Ratio = 1:2. 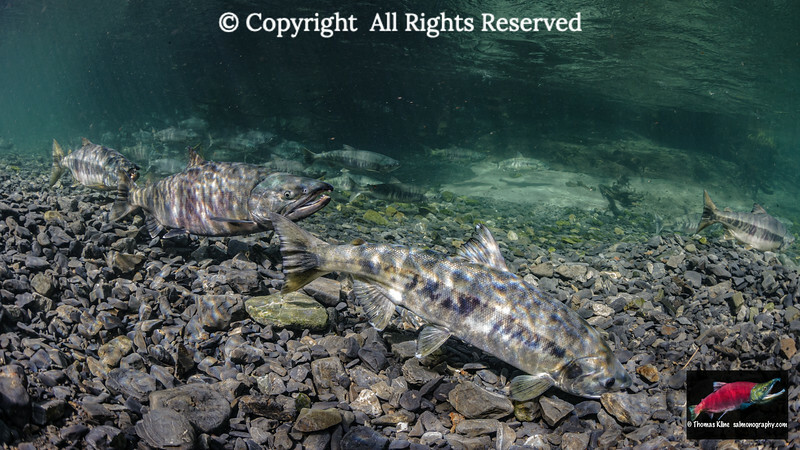 Chum Salmon (Oncorhynchus keta) and Dolly Varden (Salvelinus malma) holding in a pool during their spawning migration in a tributary stream of Prince William Sound, Alaska. Aspect ratio = 1:2.5. 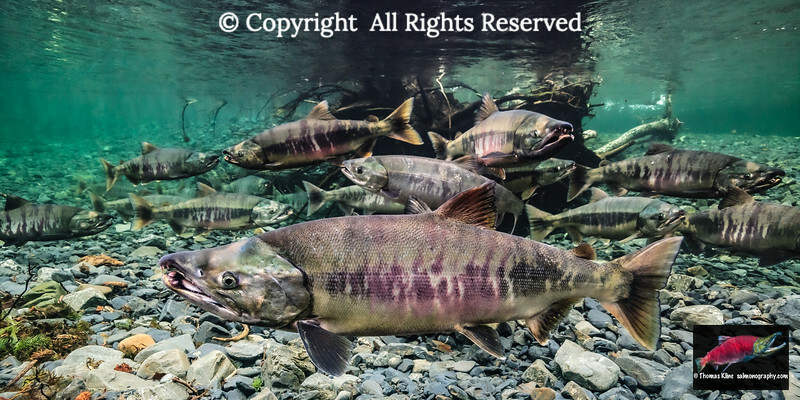 Maturing Chum and Pink salmon (Oncorhynchus keta, O. gorbuscha) on their spawning migration in a tributary of Prince William Sound, Alaska. Aspect ratio = 1:2.5. 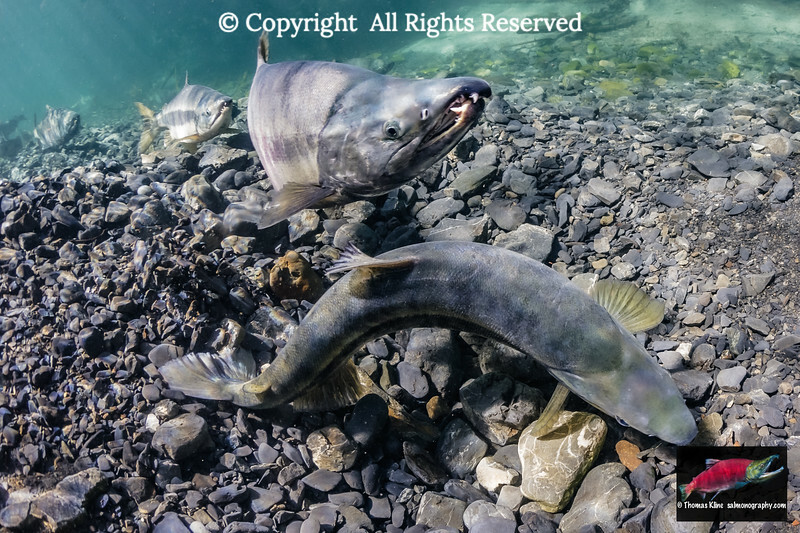 Chum and Pink salmon (Oncorhynchus keta, O. gorbuscha) in a tributary of Prince William Sound, Alaska. Aspect ratio = 1:2.5. 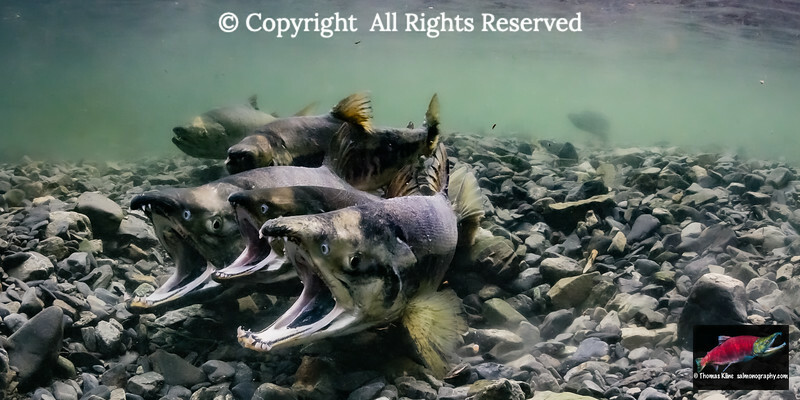 Male Chum Salmon (Oncorhynchus keta) have proportionately the longest teeth of the Pacific Salmon. 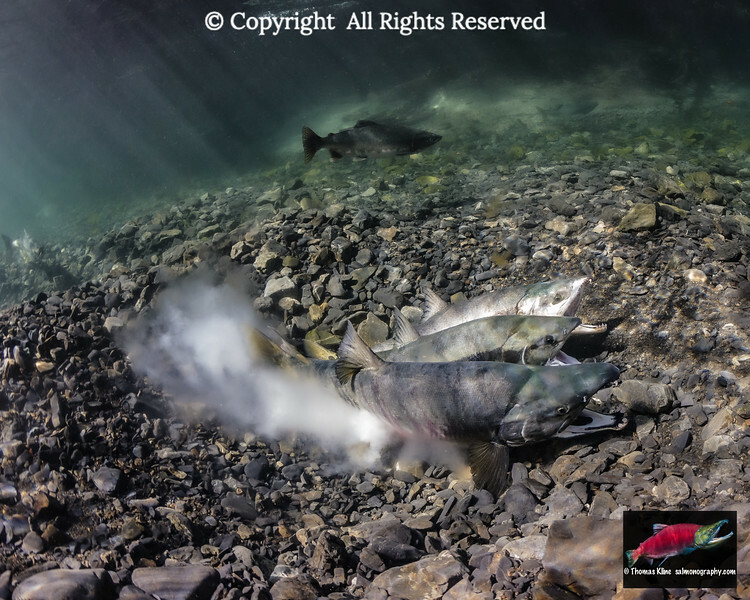 Chum Salmon (Oncorhynchus keta) spawning migration. Underwater view in an Alaskan stream during the summer. 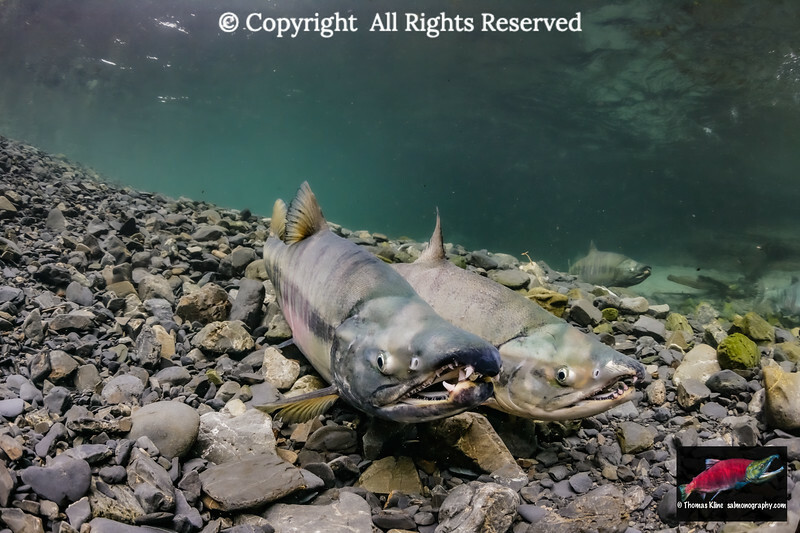 Two Chum Salmon (Oncorhynchus keta) males. Aspect Ratio = 2:3. 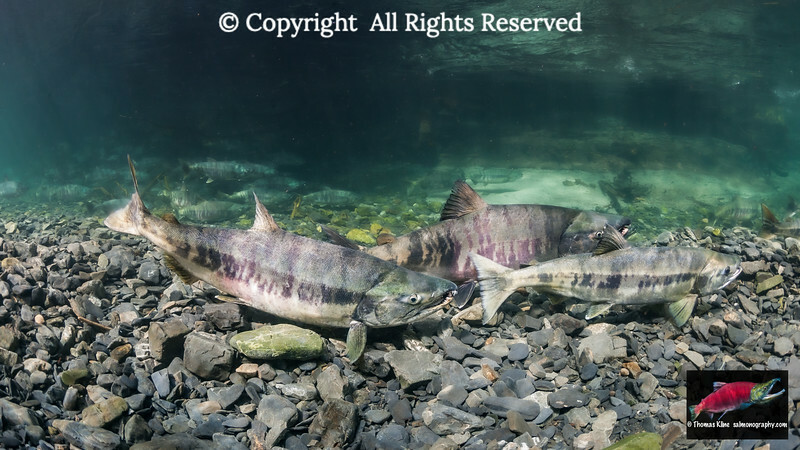 Mature male Chum Salmon (Oncorhynchus keta) size each other while competing over a female. Alpha male, closer to the viewpoint, has larger teeth than the other male. Underwater view in an Alaskan stream during the summer. 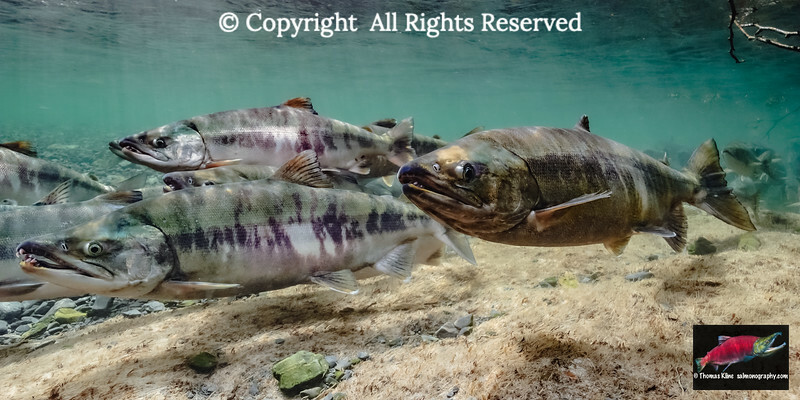 Sneaker Chum Salmon (Oncorhynchus keta) male keeping close tbas on a female with her alpha male. Aspect ratio = 2:3. 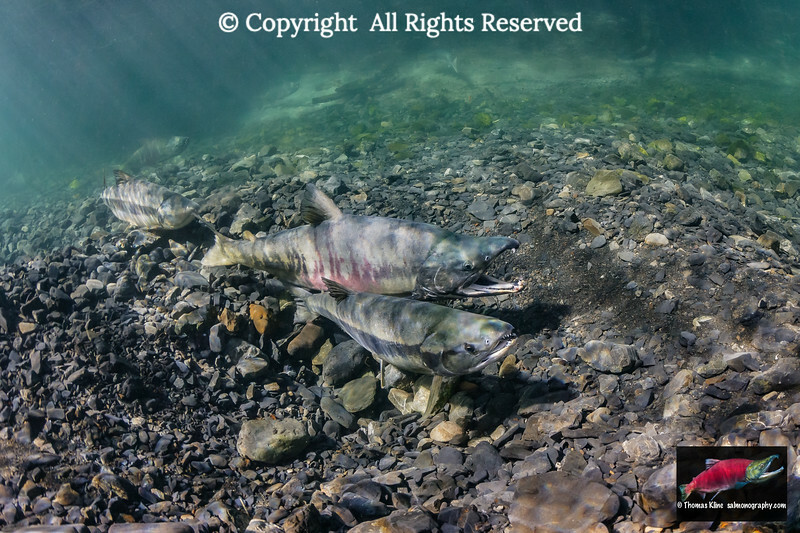 Female Chum Salmon (Oncorhynchus keta) dipping her body. This brings her keen olfactory sensors close to the bottom of a stream at a location where she is about to excavate her redd. 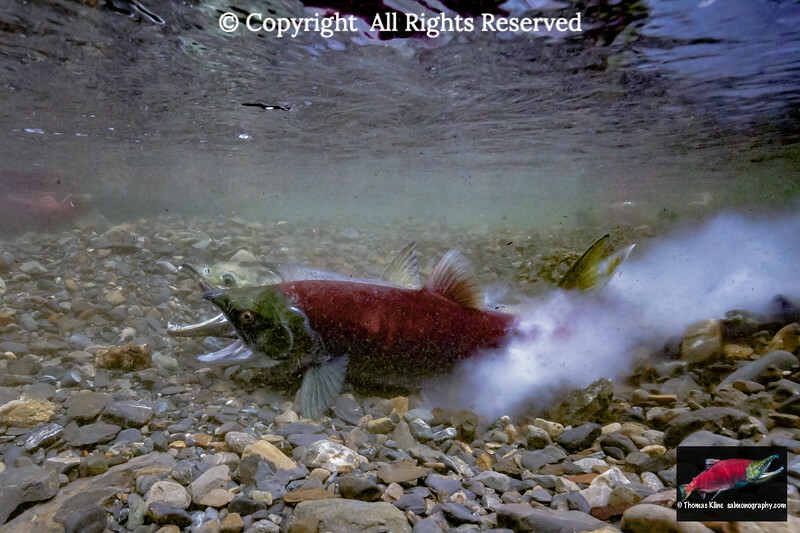 Female Chum Salmon (Oncorhynchus keta) sniffing the water where she is building her redd as a male guards. Underwater view in an Alaskan stream during the summer. 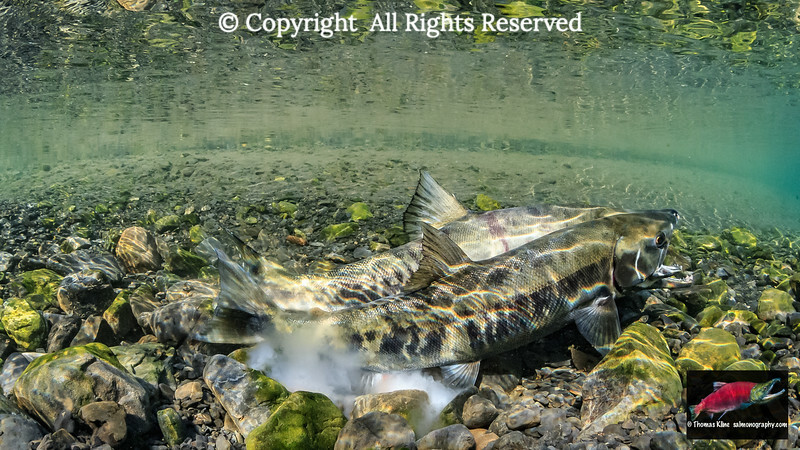 Female Chum Salmon (Oncorhynchus keta) probing her redd while a male guards. Aspect Ratio = 2:3. 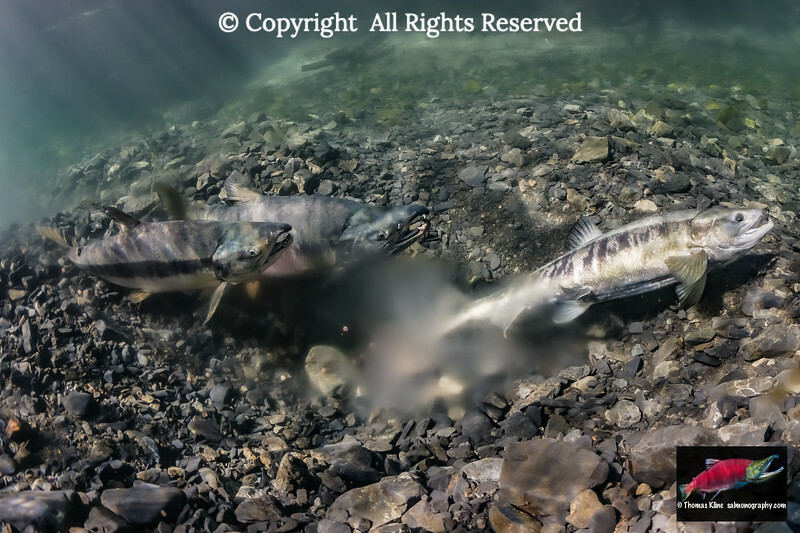 Female Chum Salmon (Oncorhynchus keta) excavating her redd as a alpha male guards. Aspect Ratio = 4:5. 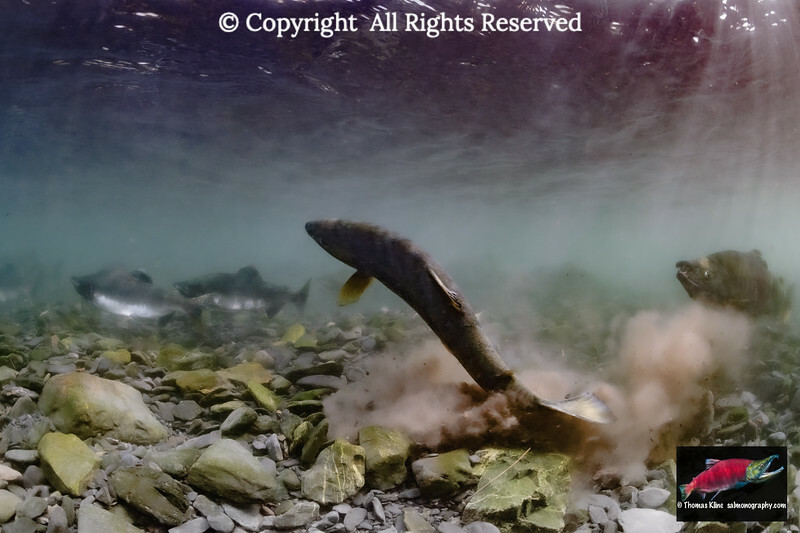 Female Chum Salmon (Oncorhynchus keta) excavating her redd as a male guards. Aspect Ratio = 2:3. 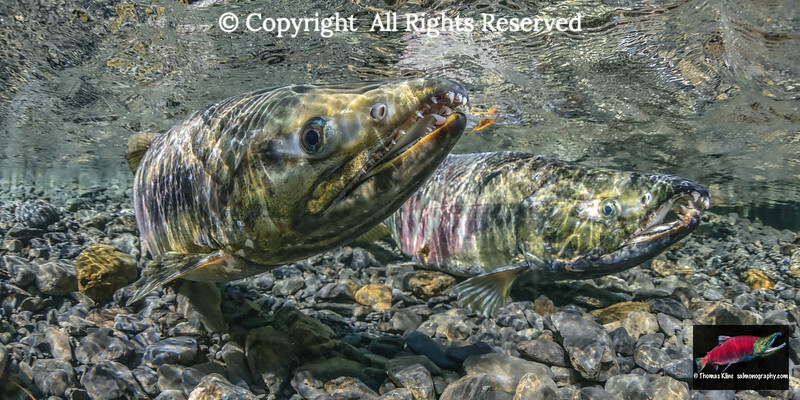 Female Chum Salmon (Oncorhynchus keta) probing her redd as a courting male gapes and crosses over. Aspect ratio = 2:3. 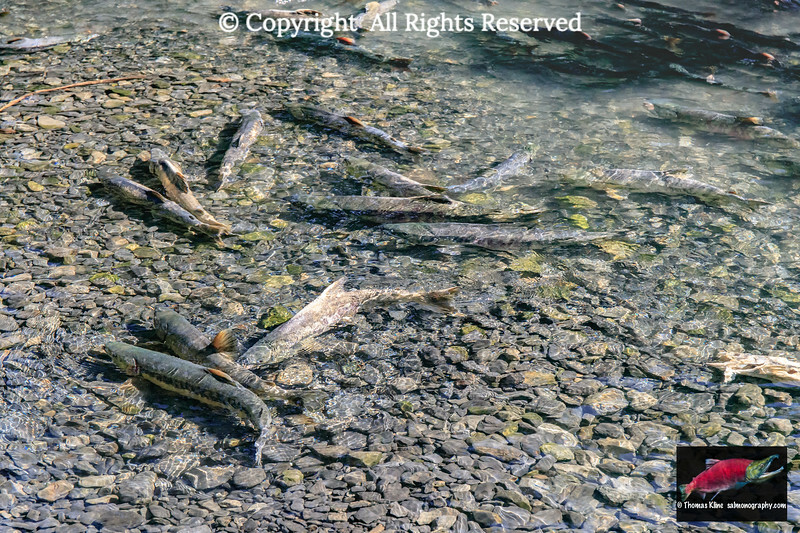 Chum Salmon (Oncorhynchus keta) spawning. Aspect Ratio = 4:5. 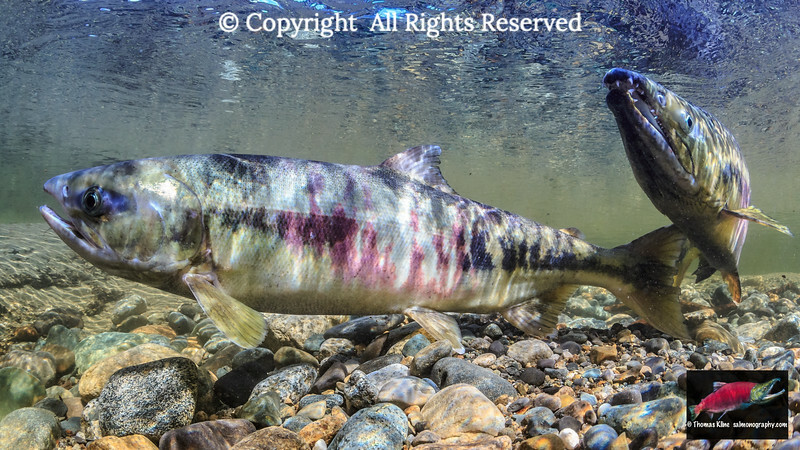 Female Chum Salmon (Oncorhynchus keta) starts covering her redd immediately after spawning. Aspect Ratio = 2:3. 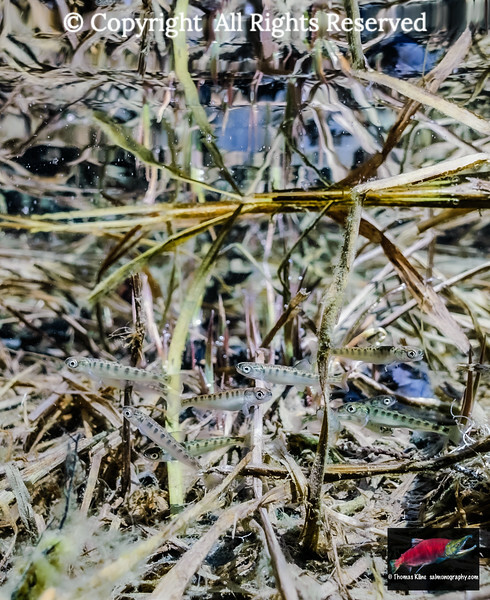 Chum Salmon (Oncorhynchus keta) spawning in the intertidal portion of a creek. Aspect Ratio = 1:2. 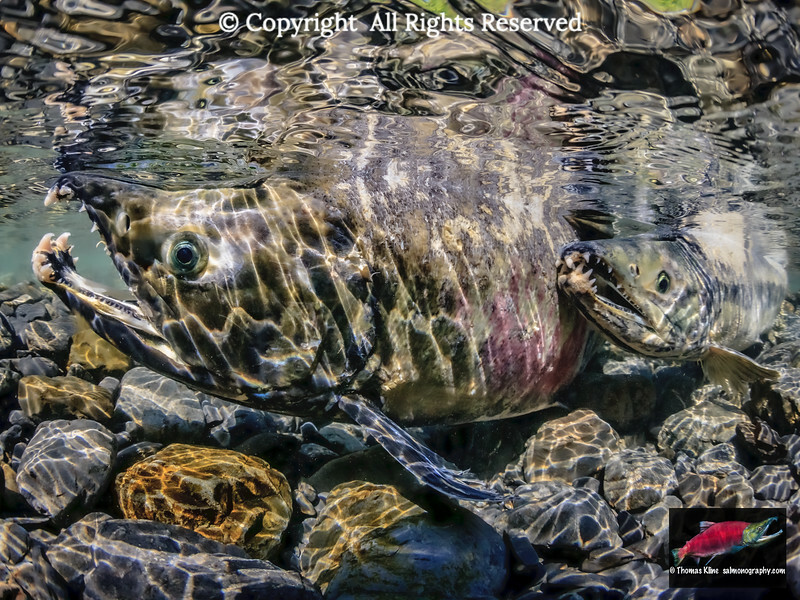 Chum and Pink salmon (Oncorhynchus keta and O. gorbuscha) spawning migration. Aspect Ratio = 1:2. 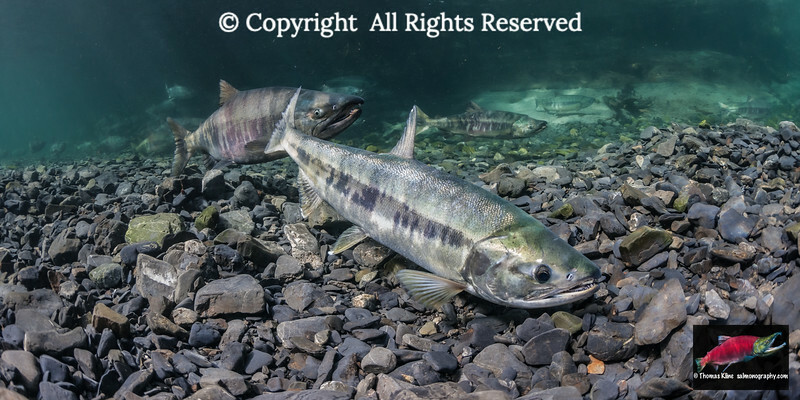 Alpha male Chum Salmon (Oncorhynchus keta) and a sneaker male. Aspect Ratio = 3:4. 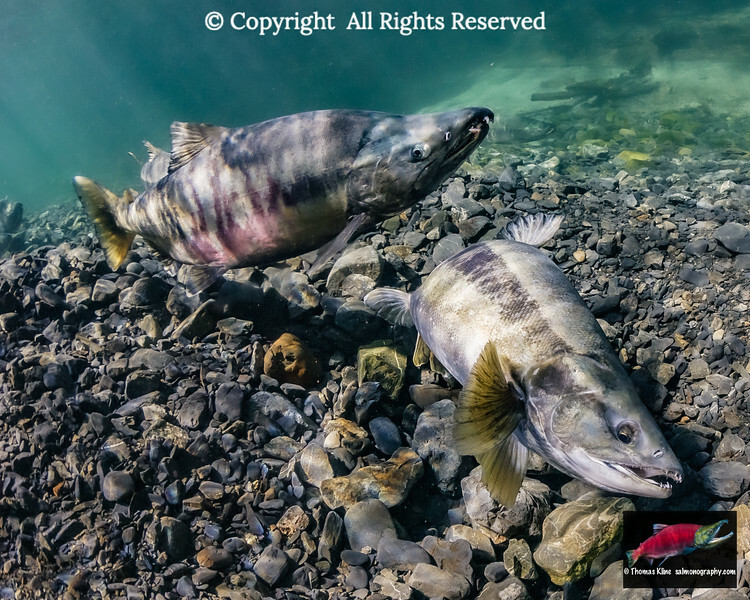 Chum Salmon (Oncorhynchus keta) spawning pair. 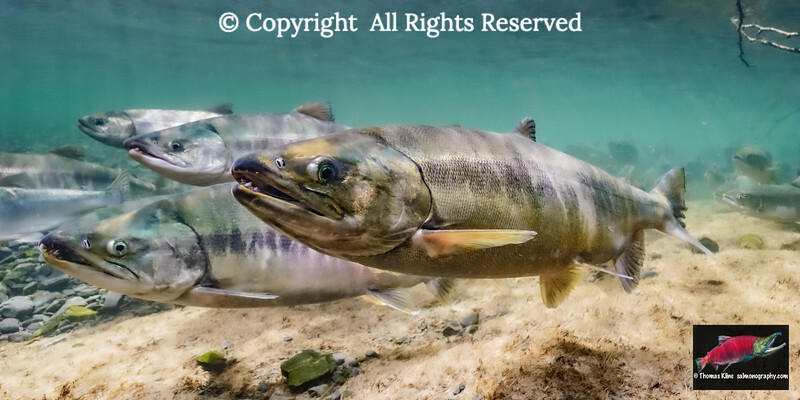 Alpha male Chum Salmon (Oncorhynchus keta) crosses over the female he is courting. 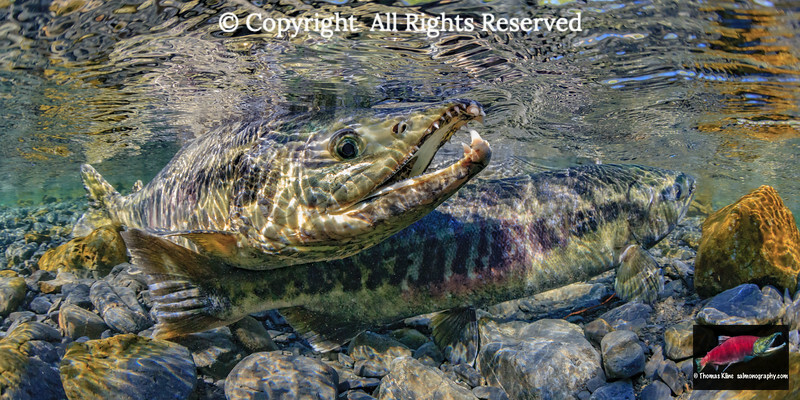 Chum Salmon (Oncorhynchus keta) female optimizing olfaction by dipping her body. 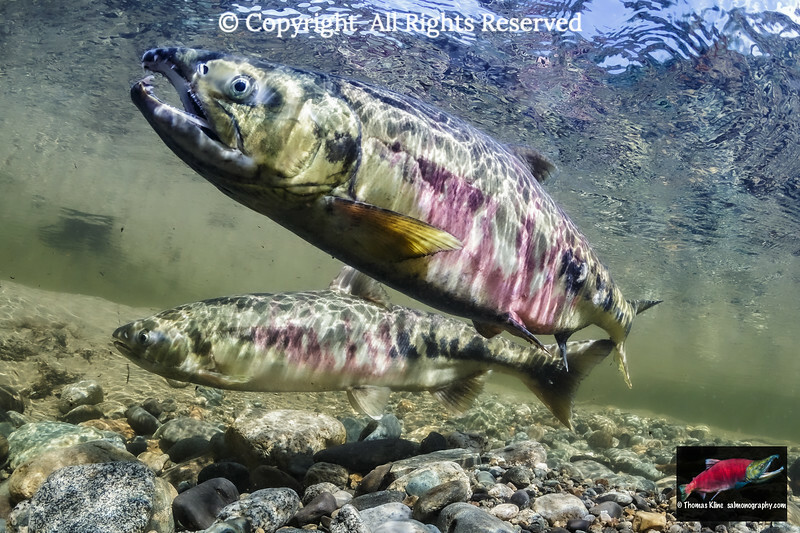 A female Chum Salmon (Oncorhynchus keta) probes while alpha male blocks a rival's access by crossing-over. 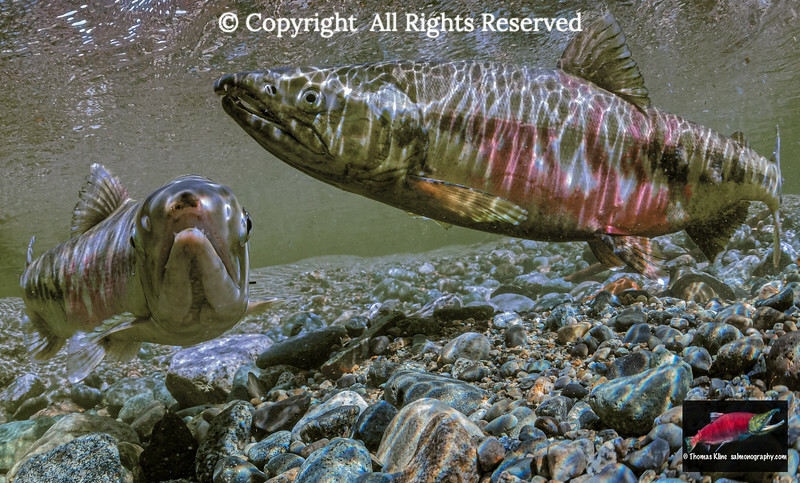 A male Chum Salmon (Oncorhynchus keta) spawns with a female Sockeye Salmon (O. nerka). 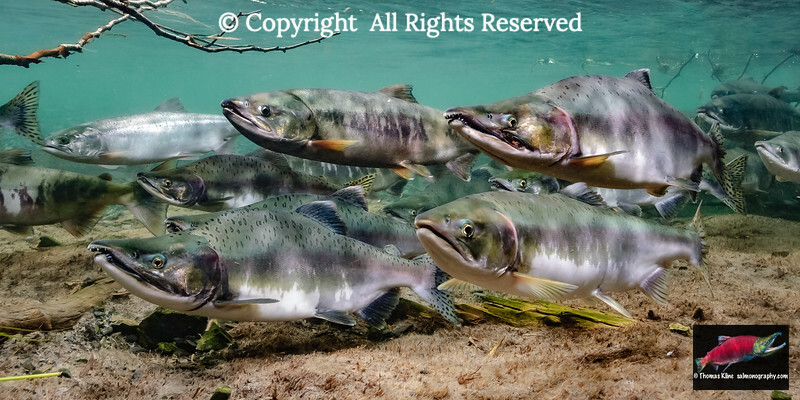 Viable hybrids are possible between Pacific salmon species. 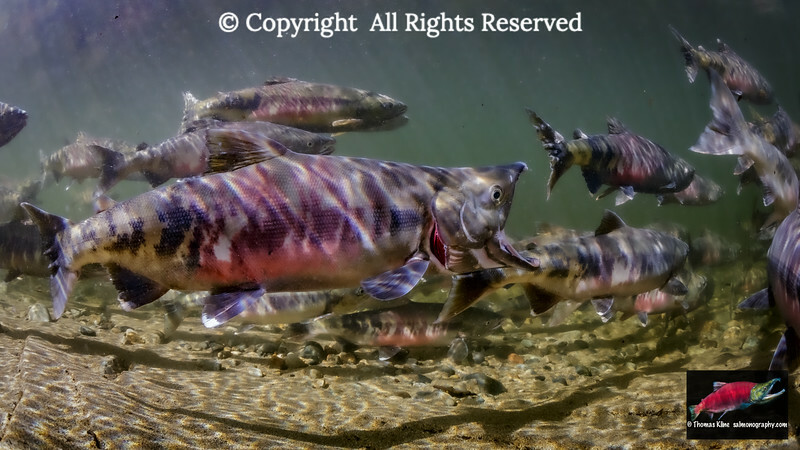 A Gaping male Chum Salmon (Oncorhynchus keta) in a school of conspecifics on their spawning migration in Montana Creek, near Talkeetna, Alaska. 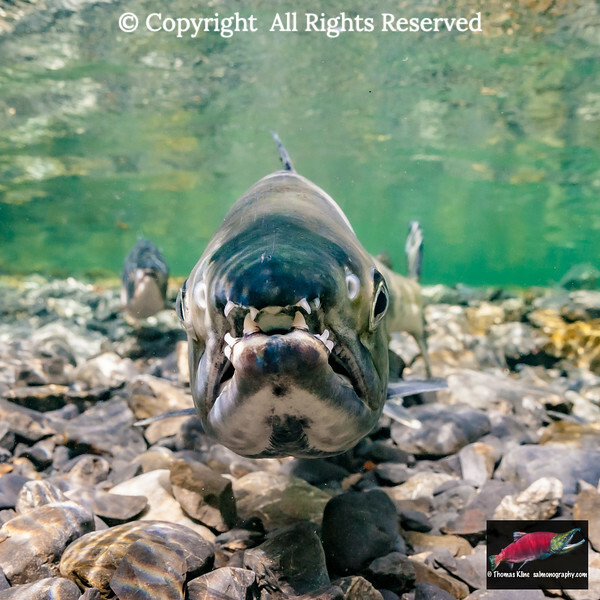 Both sexes gape as a female Chum Salmon (Oncorhynchus keta) probes her redd shortly before spawning as a juvenile southern form Dolly Varden charr (Salvelinus malma lordi) awaits a meal of salmon eggs. Photographed in situ using a Canon 1Dx camera in a Seacam underwater housing. 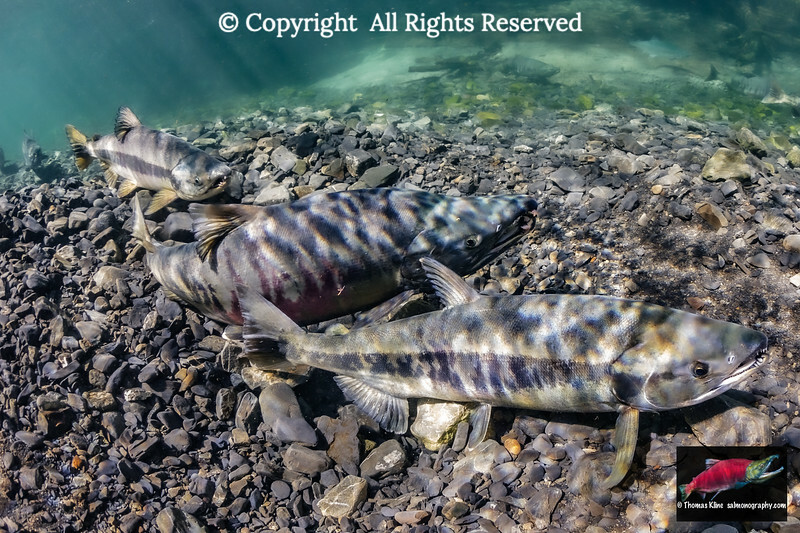 A pair of Chum Salmon (Oncorhynchus keta) spawning in Hartney Creek near Cordova, Alaska. Photographed in situ using a Canon 1Dx camera in a Seacam underwater housing. 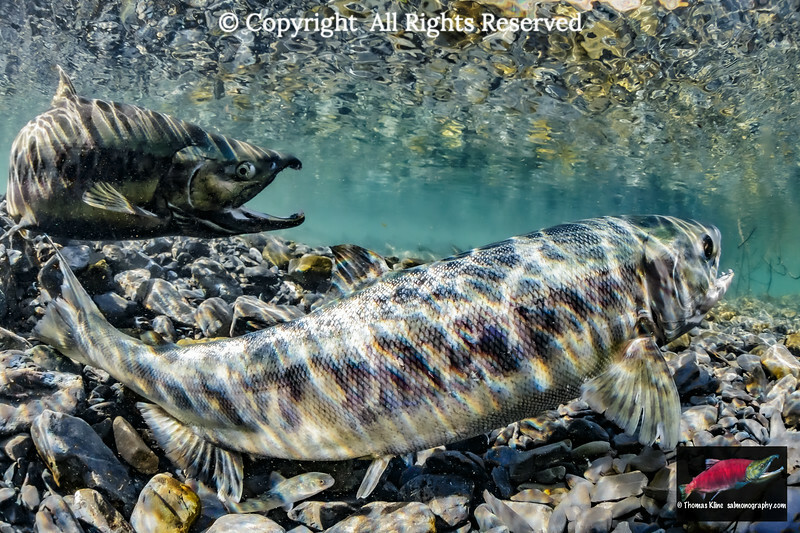 An alpha male Chum Salmon (Oncorhynchus keta) gapes while courting the female just ahead of him signaling his intentions to her as well as threatening two rival and gaping males. As well, another female watches as she is guarding her redd just downstream. Also visible at the top of the frame in this topside view is a school of migrating salmon in deeper water. 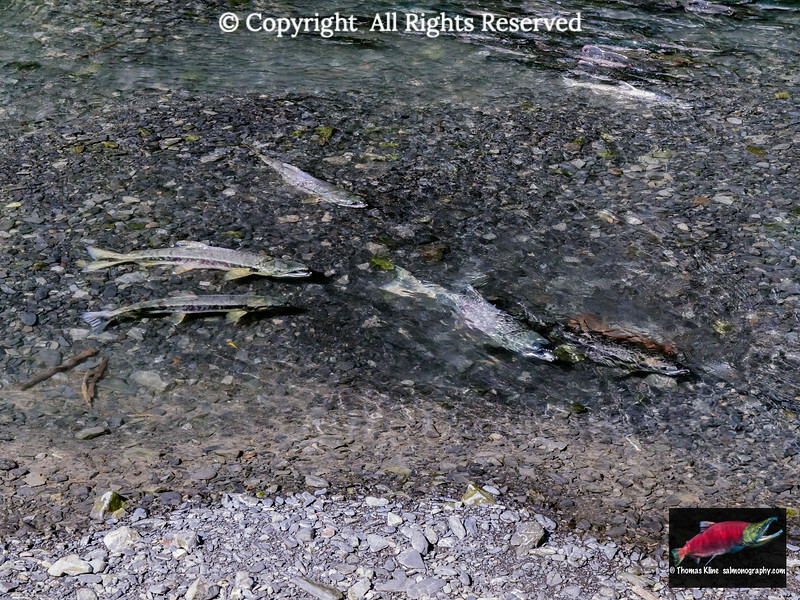 Two pairs of Chum Salmon (Oncorhynchus keta) on redds in the shallows of Hartney Creek alongside a massive school of migrating salmon in deeper water (upper right) in this topside view. A competing male is attacking the male courting one of females (lower pair in frame). Other males hoping to sneak-spawn with one of these females wait nearby.